Hello Linux Geeksters. 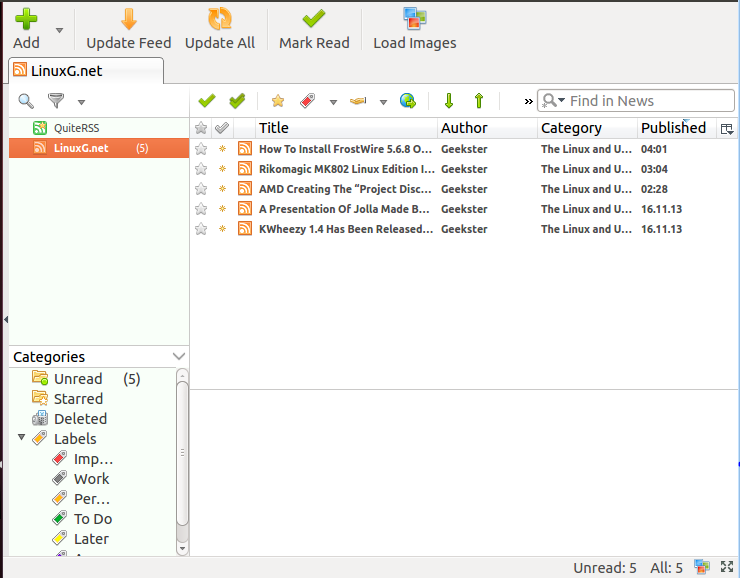 As you may know, QuiteRSS is an open-source RSS reader, written on Qt and C++. The latest version available is QuiteRSS 0.15.0, which has been released yesterday. For a full list of features and improvements, see the official changelog. In this article I will show you how to install Quite RSS 0.15.0 on Ubuntu 13.10 Saucy Salamander, Ubuntu 12.10 Quantal Quetzal, Ubuntu 12.04 Precise Pangolin, Linux Mint 16 Petra, Linux Mint 14 Nadia, Linux Mint 13 Maya and Elementary OS 0.2 Luna. you may want an rss reader that downloads the “new stuff” on the local computer, in order to access the new information offline, for example.